Get your holiday shopping done while helping out a local program that fights against homelessness! 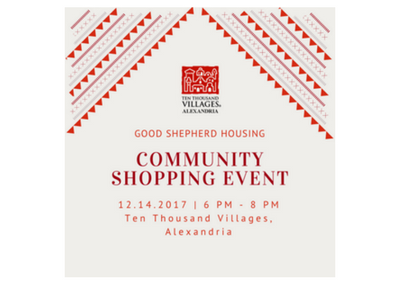 10,000 Villages of Alexandria will be hosting Good Shepherd Housing for an evening of shopping and fundraising. 10-20% of revenue during the event will be donated to GSH. Address: 915 King Street, Alexandria, Va.